The Waipawa community is slowly coming to terms with the slandering its town icon received when labelled “the most offensive ornament in the whole of New Zealand” on nationwide radio last week. The comments – aimed at the town’s ornamental duck – came from Radii Pacific’s Paul Henry after people were asked to phone in and nominate “Achilles heels” in their towns. Mr Henry said that the duck kept getting mentioned, and was horrified, when he saw a photo of it, calling it “the worst town fiasco in the country”. With a twist of the knife he added, “…and what makes it worse is the hideous plinth it’s sitting on”. Some locals are known to be a lot less affectionate towards their duck than others, but Central Hawkes Bay Mayor Tim Gilbertson leapt to its defence. For the icon’s creator, Jan Gosling, the negative comments were water off a duck’s back. 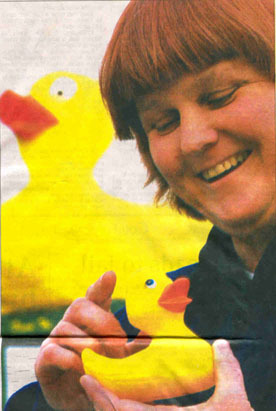 Mrs Gosling said the duck was initially built at the request of the Waipawa Chamber of Commerce to promote the annual duck race. It was to be made by papier mache and transported around on the back of a ute, but it soon became obvious that papier mache wouldn’t stand up to the elements. “They said to make it out of something else, so I took on the challenge and made it out of fibrous cement,” Mrs Gosling said. The finished product weighed in at 400kg and was too heavy to be transported on the back of a ute. Instead a stand was made and the duck placed in the middle of town. “It has laid and egg and created a lot of interest in the town. Some people don’t like it, but you’ll always get that.” Mrs Gosling said. labelled a “town fiasco” on nationwide radio. She said that all town’s have icon knockers. Sculptor Denis Hall, who made Te Kuiti’s giant shearer, said icons were important assets to towns, giving them all identity. Even if they were controversial or ugly, they could be inexpensive promotional tools and tourist attractions. Perhaps the most controversial icon debate in the country’s recent history involves a community split in Dannevirke over whether or not a 10m tall, sword-toting Viking should be erected on a public domain at the northern end of the town. Progress was halted by angry locals who said Vikings represented murderers and rapists, and could attract undesirables to the town. “There’s a lot of ill feeling about it down here,” one Viking opposer revealed. The initiative was knee-capped when permission to use the domain was denied, but promoters of the idea have lost none of their steely determination. Mr Hall who is waiting eagerly to get cracking and built the Viking, said the fact of the issue had been on two news channels and in newspapers nation wide without the project even getting off the ground showed the amount of public interest that town icons could stir up. He guessed the Waipawa community would have to become more attached to its duck than ever before once its ruffled feathers had settled back down.